If one has to ask Mohanji what he would like as a gift for his birthday or some other special occasion, Mohanji’s answer is always that he wants nothing from us. He does everything out of unconditional love, so he has no expectations of anything in return. We read that the best way to show appreciation to your Guru is to live his teachings. 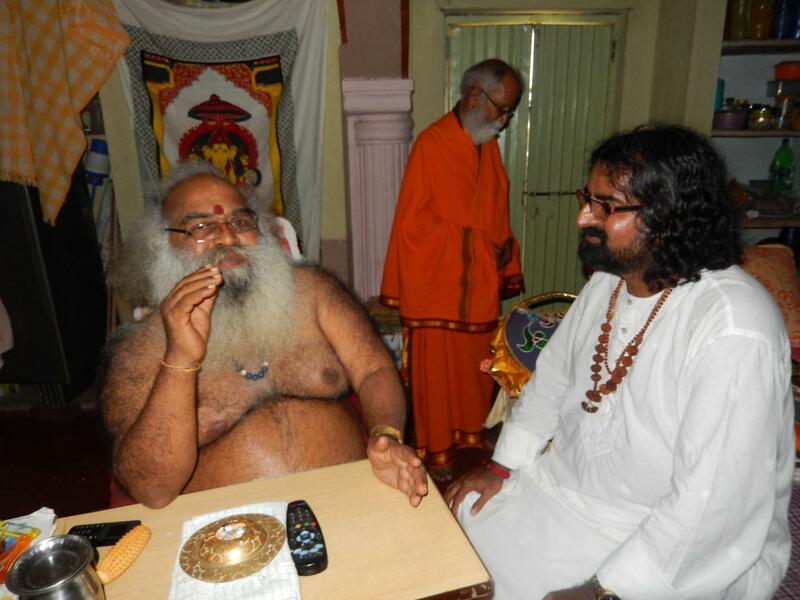 And I agree, this is the best way to show your appreciation to your Guru. But at times, you want to do something that is more tangible…more physical. Guru Purnima is really the one day that means the most to me in the entire year. It is very difficult for me to describe what Mohanji means to me. He is with us each and every second. He guides me, protects me, and teaches me about the true meaning of love, devotion, consistency, and purposeful living. But this is only the tip of what Mohanji had done for me. He gives me renewed purpose when I feel am failing at this game called life. There are no longer difficulties in my life… I now see them as expressions of Mohanji’s grace. Even when things go wrong I am comforted that if Mohanji allows it, then it is for my best. Mohanji has changed my life . I cannot tell you exactly how and in what way because no words can explain this. I have no words that can describe how much Mohanji means to me, how much he means to us all. And this is a dilemma…. Because I want to tell Mohanji that I appreciate everything he has done for me and that I love him not only as my Guru but also as my Father, Mother, and Devata. So to show love, I wanted to offer the highest possible act I could think of using this human body. For Gurupurnima, I decided to have two tattoos done. On my right arm I tattooed Mohanji’s yantra, Mohanji’s gayatri mantra and the last line of the Guru padukam strotram (namo namha shri guru padukabhyam). One my left arm, closest to my heart, I wanted a portrait of Mohanji in ShivaBhava. It took three days to complete the yantra and mantra on my right arm. It was physically very painful. The tattoo is over my entire right arm, and spreads over the soft inner arm and also over the very sensitive stretch marks I have. There was a lot of swelling, tenderness, and agony due to my skin being pierced hundreds of times a minute, while wiping off ink over the open wound. Although Ajay was sick he came with me for moral support. Thank you Ajay! But when he saw what was happening he left the tattoo room lol. He could not handle the needles and the blood and how tender the tattoo looked as the artist was doing his job. He sat quietly on the couch and eventually fell off to sleep. This tattoo was done over two days. One the first day the artist did the inner part of the yantra and on the second day he did the mantras and outer part of the yantra. All in all, we probably spend 15-18 hours on the tattoo. We then started work on the portrait. If you think the first tattoo was painful, it was nothing compared to the pain of the portrait. Because of the shading that is required, the artist had to go over the same place a few times to get the intensity of the shading correct. So he coloured one area in, and then he had to go over that same area again and again. That tattoo look a few hours more that the first tattoo. This tattoo had the hallmark of Mohanji… fluidity. We started with a rough plan, but it eventually ended up being Mohanji’s face in shivabhava, on a mirror and nagaraja over him. This is very symbolic to me and I will explain its meaning in another post. I got lots of scolding from my friends and doctors lol. Being a bad diabetic and with my current state of health, I can understand why they were upset. But amazingly, the tattoos are healing so fast. The scabs that covered the open wounds formed in day and fell off in three days. Unlike the mantras on my forearm which took the scab two weeks to form and another two weeks to fall off. Although there was lots of physical pain, this experience was so joyous to me. Every moment was an offering from my heart to Mohanji. Every moment was ecstasy. The love that flowed from my heart was all that mattered. During the tattooing of Mohanjis portrait, I suddenly felt Mohanji’s presence and then the tattoo artist and myself simultaneously noticed something on my forearm. I touched it in an attempt to brush it off, and then I realised that it was vibuthi and chandan. The tattoo artist stopped his work and put the tattoo machine down and asked me what that is. I casually said that these are holy powders that my Guruji materialised to say that he is happy with the tattoo. The tattoo artist went pale and said he definitely knows that nothing was on my hand and my hand was right next to him. He started to freak out a bit lol hahhaha…such is Mohanjis way lol. He looked more bit pale and then walked to the window and had a long smoke. He came back to me and started his work, trying to ignore what happened. But I did catch him glancing at my forearm now and again at the place where the vibuthi and chandan materialised hahahaha. Mohanji, I offer this to you from the very depth of my core. The tattoo’s on this body is symbolic of my love to you, my promise of consistency to you, and my promise to be your instrument always. This is my promise that you are the purpose of the purposeful life I wish to lead. Just like how it is impossible to remove a tattoo of this size, I pray that my devotion to you will always grow and that I am made worthy of never leaving your holy feet. Vittal Babaji appeared as a 7 year old boy at Pandharpur in Maharasthra, India. He was found by Sri Sri Kaikadi Maharaj. In his 8th year, one night while asleep, he was taken to Shirdi Sai Baba and blessed by him and remained in Shirdi for a while. After a few days, Sai Baba appeared to Sri Kaikadi Maharaj in a dream and advised him to take his disciple back. Since then, this miracle boy started showing many leelas. 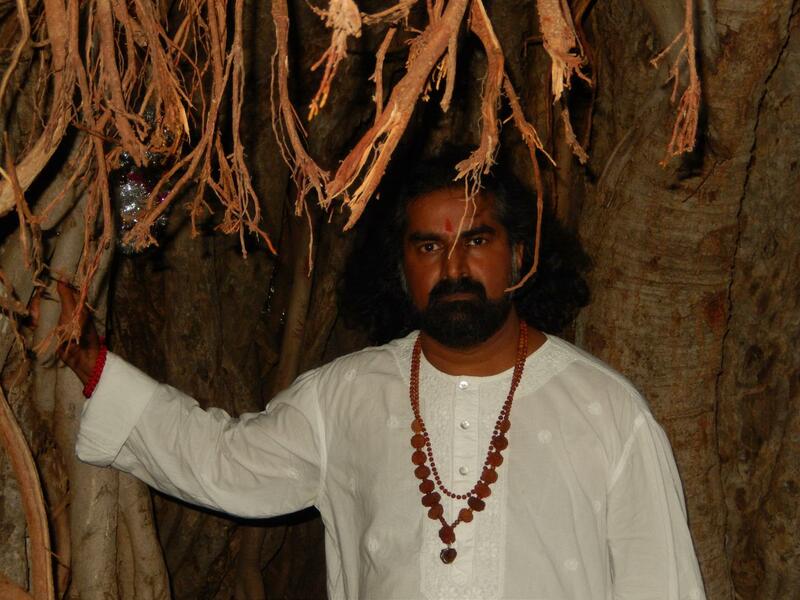 Vittal Babaji is from the Sri Sri Sarveswarananda Saraswathi Maharaj, famously known as Mahavatar Babaji, Guru Parampara i.e. (tradition). 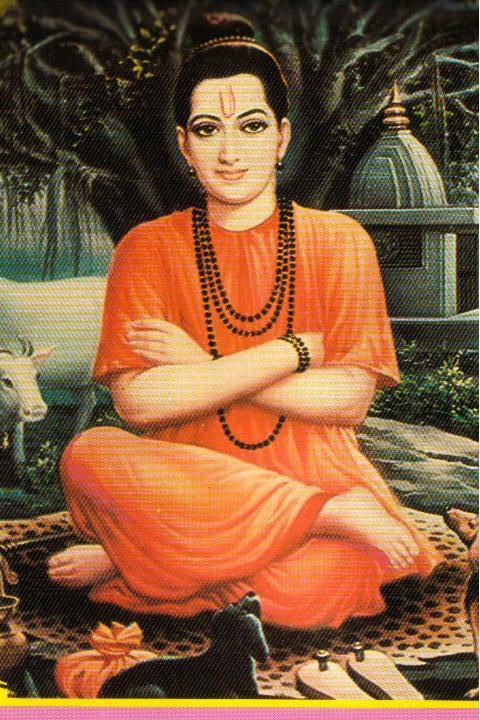 Sri Sri Mahavatar Babaji’s disciple was Sri Sri Nityananda Saraswathi Maharaj whose disciple was Sri Sri Sri Niranjanada Saraswathi Maharaj who initiated the sanyas deeksha to Vittal Babaji. 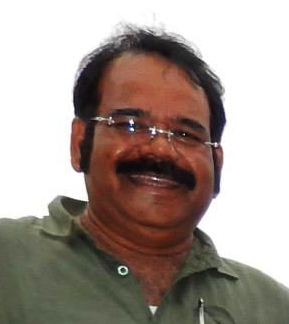 He was given the deeksha name as “Sri Sri Sri Vittalananada Saraswathi Maharaj”. Vittal Babaji was a contemporary of Sri Chinmayananda of Chinmaya Mission, while undergoing spiritual learning at Rishikesh. Vittal Babaji journeyed on foot all over India and visited all the holy places, including the Kailas Manasarovar Yatra. He visited Andhra Pradesh several times, spreading the Datta tradition and Shirdi Sai leelas there. He was brought to Andhra Pradesh in 1966 by the Chief Minister of AP, the late Mr.Kasu Brahmananda Reddy and thereafter Vittal Babaji made AP his home state. Many Shirdi Sai / Datta temples were constructed / inaugurated by Vittal Babaji. 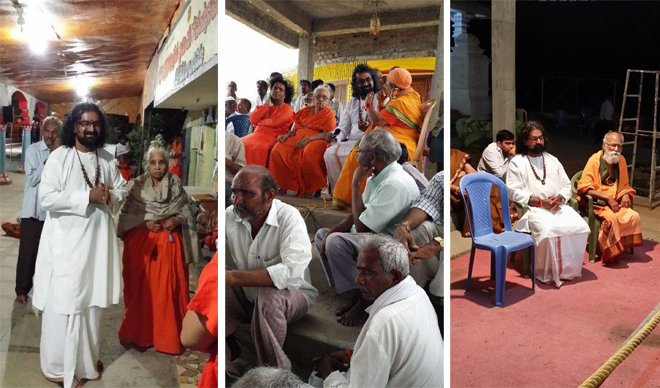 He conducted Shirdi Sai Sat Charithra / Guru Charitra Parayanas at several places across the state. As advised by the Lord Sripada Srivallabha, he constructed Jagadguru Sri Sri Sri Dattatreya Swamy Mahasamsthana Peetham (Sri Datta Peetham), near Kuruvapur viz., Srikshetra Sri Vallabhapuram. Along with the Dattatreya temple, several other temples were constructed on the banks of river Krishna. The place is blessed with the first Datta incarnation of SriPada Sri Vallabha. Sripada Swamy used to conduct his Darbar, perform Surya namaskarams. As an evidence of these events the Bhaskar banda, Trisulam stone, and Sahaja Ganapathi are now kept in a pious way. 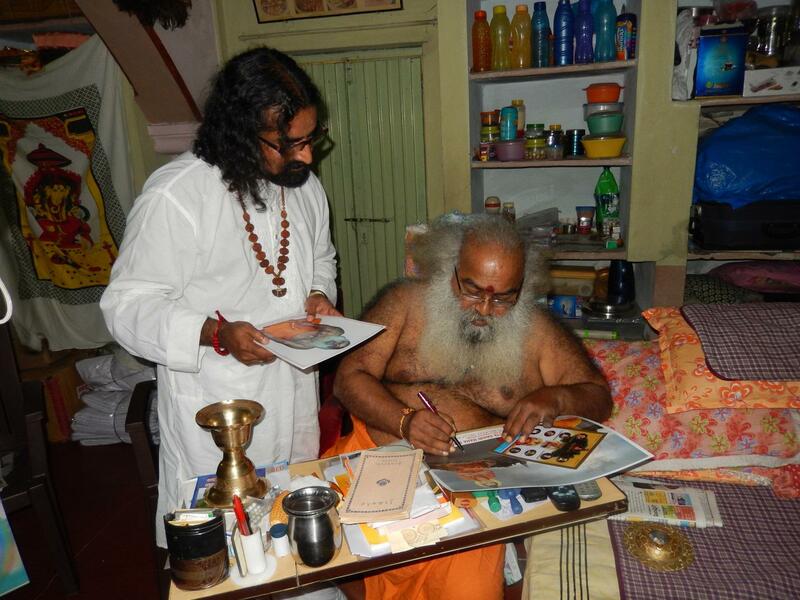 Sri Vittal Babaji wrote the full life history of Sri Swamy Samarth, in Telugu and the book will soon be published in Kannada. With His blessings and under His supervision the life history of Sri Shankar Maharaj, Pune was also published in Telugu. Vittal Babaji attained Mahasamadhi on 18th July 2014 and the final rites were performed at Srikshetra Sri Vallabhapuram on 19th July 2014, a ceremony which was attended by several spiritual leaders including Raja Yogi Sri Mohanji. While addressing the funeral gathering, the representative from Sri Ganapathi Satchidanandaswamy Ashram of Mysore said that Vittal Babaji had close intimacy with Sri Ganapathi Satchidananda swamy. Vittal Babaji attended the Birthday Celebrations of Sri Ganapathi Satchidananda swamy at Mysore Ashram. 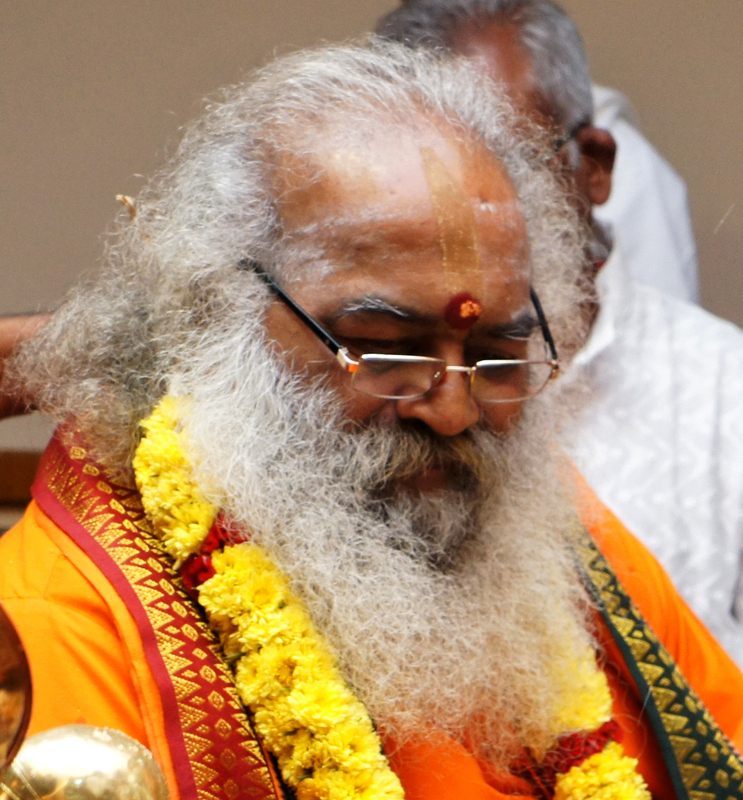 Sri Ganapathi Satchidananda swamy lauded Vittal Babaji as the fatherly figure of the Sri Datta Tradition. Another spiritual leader Sri Siva Sai Baba said that Vittal Babaji’s soul had left the body to become another Universal Master and that therefore his age is 2 days as Universal Master and none of the devotees should grieve over Vittal Babaji leaving the body. 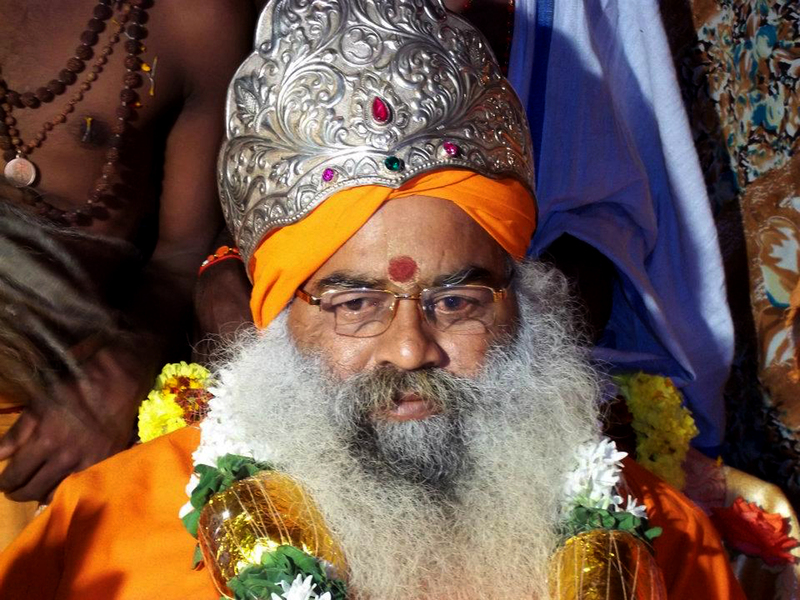 After the Mahasamadhi of Vittal Babaji, Sri Ramaprasannanda Saraswathi became the Peethadhipati (Head) of Jagadguru Sri Sri Sri Dattatreya Swamy Mahasamsthana Peetham (Sri Datta Peetham). 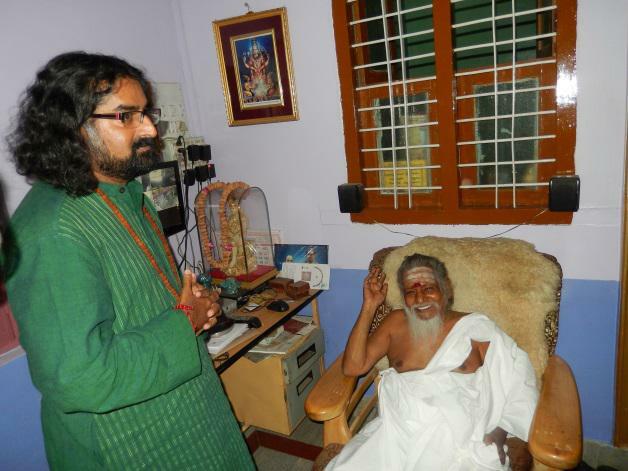 I met Vitthal Babaji for the first time at Kurvapur on June 23rd 2014. 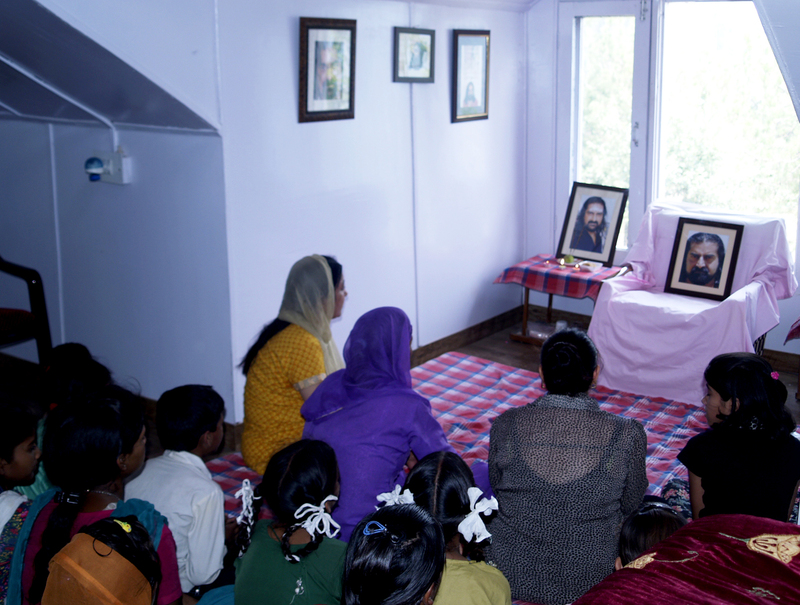 During our stay at the ashram our lives were filled up with Babaji’s Unconditional love and affection. I never imagined though that my second visit would take place three weeks later, to attend the Mahasamadhi ceremony of Babaji. On July 18th at 5.00am, Babaji left His physical body and merged with the Supreme. 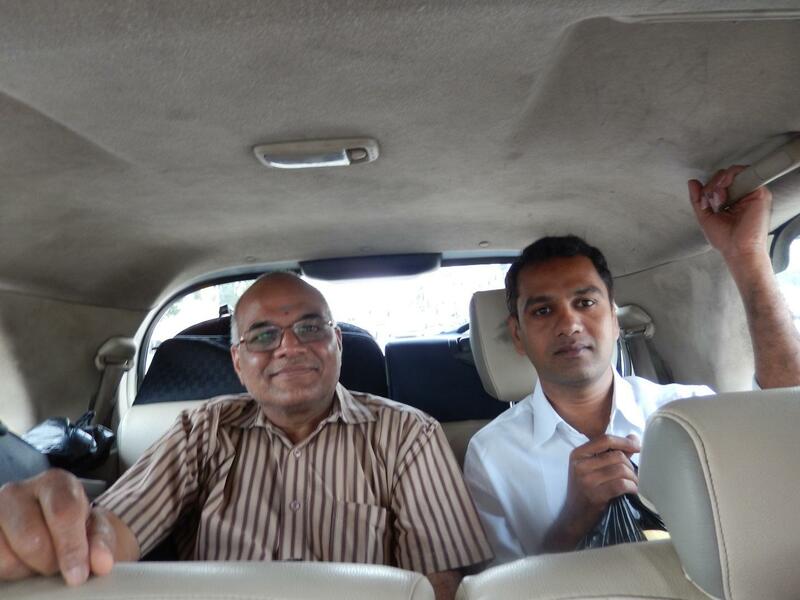 Shri Mohanji, Shri Krishna Murthy garu, Nandita didi and I started our journey together from Hyderabad to Kurvapur. As we approached the Ashram at midnight I experienced a strong feeling, as if a Father was waiting to see His son again and perform His last rites. On entering the Samadhi Mandir premises we saw Babaji’s physical body being kept in an incubator with devotees gathered around. Shri Mohanji was sitting very close to the incubator and one could make out that a conversation was taking place between the Father and the Son, on a different plane. 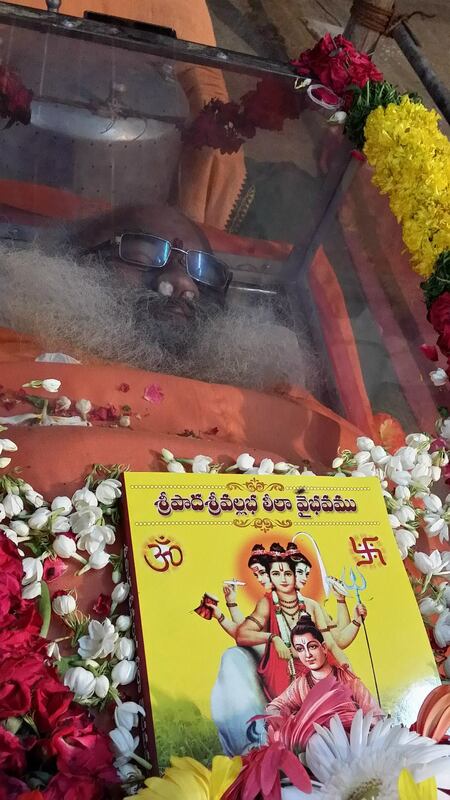 Vittal Babaji giving His last divine Darshan to all devotees and loved ones before He was laid to rest in His Samadhi. 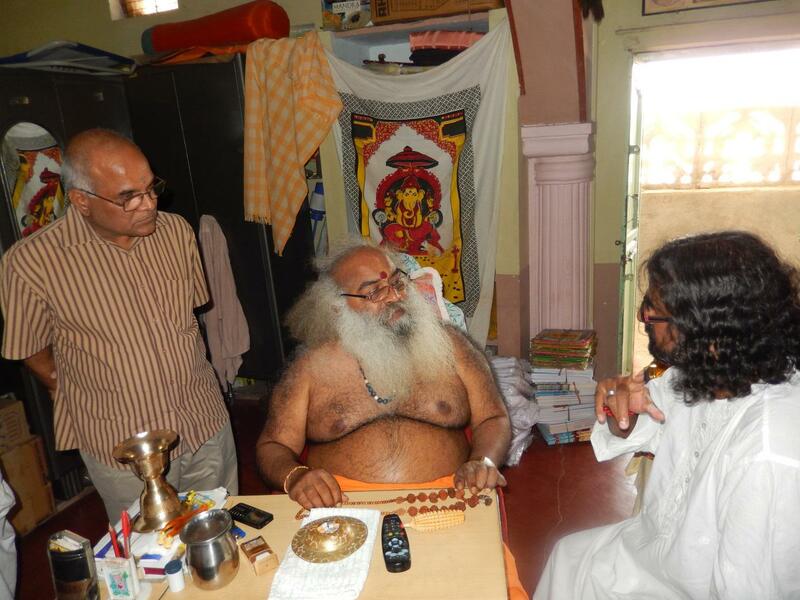 The Trustees of the Ashram requested that Mohanji perform the Ganesh puja as well as the first dig at the place where the Samadhi was to be built. Mohanji confessed it was a great honour for him. This again proved the relation between Babaji and Mohanji as being that of Father and son. It also proved it was Babaji’s wish as well. 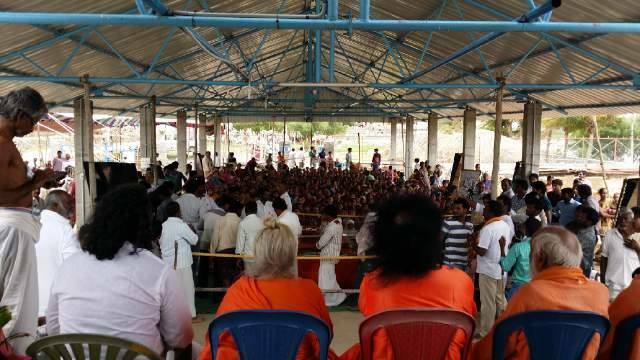 By morning large numbers of devotees started coming to the Ashram to get a glimpse and receive the blessing of their Guru. Devotees from all over the country and near by villages coming to pay their respects and get Babaji’s last darshan before samadhi. Many great Saints including Shri Vedanandaji, Shri Chaitanyanandaji and Shri Shiv SaiBabaji were present and took part in this great and special ceremony. Many Gurus came forward and expressed their pleasure at meeting Mohanji, as Babaji had always spoken to them about His greatness and they had been eagerly waiting to meet him physically one day. At around 4pm, Babaji’s body was taken around the Ashram and its adjoining area in a procession lead by all of the Gurus. It felt as if the King was being taken around his kingdom for the last time. The procession finally ended at the courtyard of the Samadhi mandir, where amidst the chanting of Vedic Mantras by the Priests, the abhishekam was done by all the saints present as well as the members of the Trust. 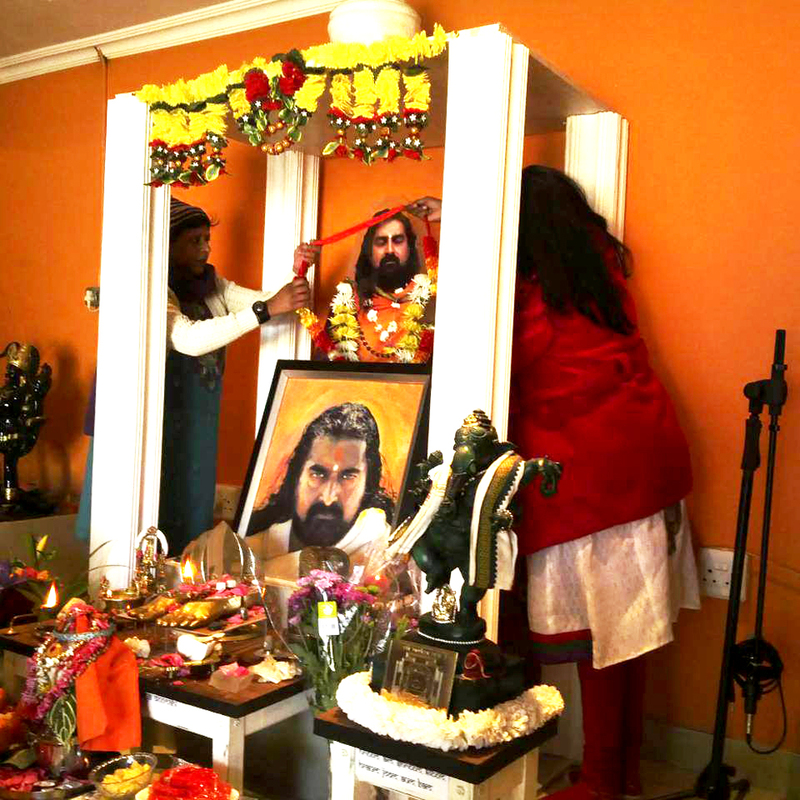 During the abhishekam, Mohanji touched Babaji’s body and was surprised that even after almost 36 hours after Babaji had left his physical body, it was supple and there was no sign of stiffness. 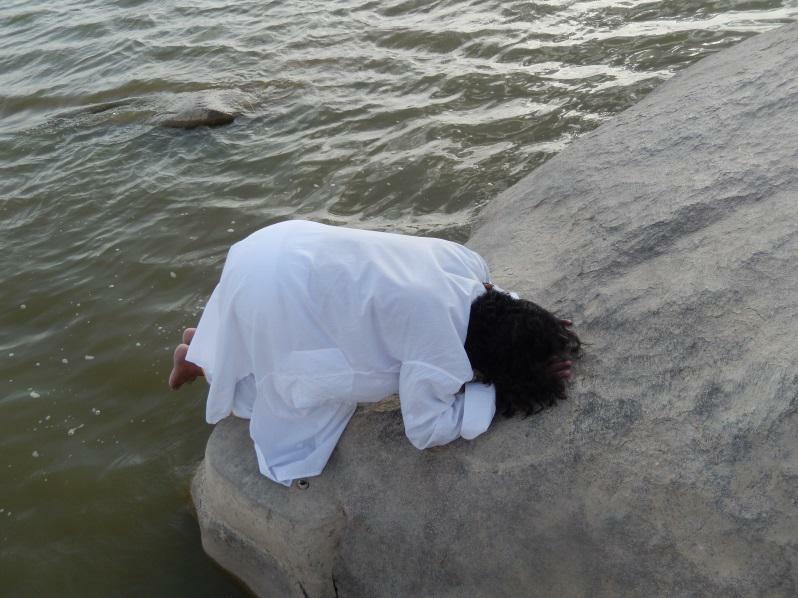 Mohanji prostrating at the Samadhi place before the digging started. Mohanji also performed the pooja during Brahma Muhurta.and initiated the digging of the Samadhi on the 19th of July. After the abhishekam, Babaji’s body was placed in a 6’x 4’ pit which was filled with sand from the Krishna river, sea salt, turmeric, ash and camphor. All the devotees were given a chance to bid a final farewell to their very dear Taata (grandfather) and Guru. In the pit, Babaji seemed to be in the Samadhi pose, his face smiling with satisfaction at having completed his task successfully and finally merging with the Supreme. 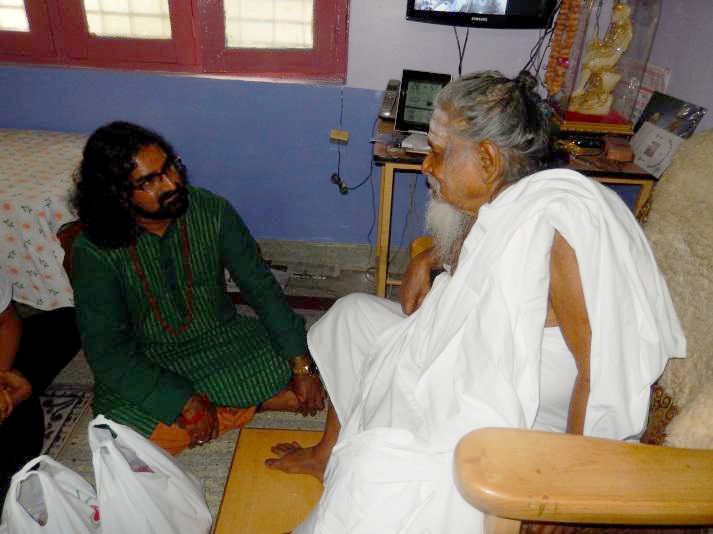 With the passing away of Sri Sri Sri Vitthalananda Saraswati an era of the Nath Sampradaya has come to an end. Though we can no longer see him physically through our naked eyes, His Blessings and love will always remain in the Hearts and Souls of His Devotees. My first read on spirituality was an autobiography of a yogi by Paramhansa Yoganandaji, an e-book in September 2013. Thereafter in April this year, I was presented two books by Dr. Deepali Jaju, I had finished reading both these, (Shri Sai Satcharitta and SreePada SreeVallabha Charitaamrutam) by the first week of June. Having read about Sai Baba and SreePada SreeVallabha, my self-awareness levels were at their highest that I had ever experienced so far. Somewhere within I had the desire to meet my Guru Sri Mohanji immediately and also visit the shrine of Vaishnodevi with him in the same trip. So I got in touch to seek his permission, his immediate suggestion was, let us go to Kuruvapuram instead. I was amazed at this response. Here I have just finished reading SreePada SreeVallabha Charitaamrutam, and I am being invited to visit the seat of SreePada SreeVallabha. I agreed immediately. 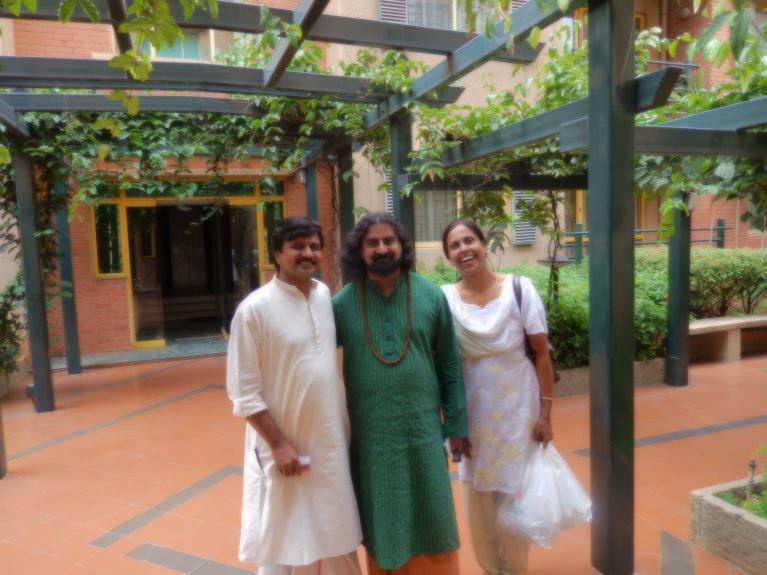 On the morning of 23rd June 2014 I landed at Bangalore for the first time and headed towards Preeti Duggal’s home, after reaching, I prostrated to Mohanji and met Rajeev, Preeti and Kiran. There was so much of love emanating from the Duggals’ home, I was overwhelmed. While we were on the breakfast table, Kiran suggested that there is a spiritual siddha and Dattatreya bhakta in Bangalore. On hearing this Mohanji wanted to meet him in the afternoon. The plan was mooted for the afternoon. 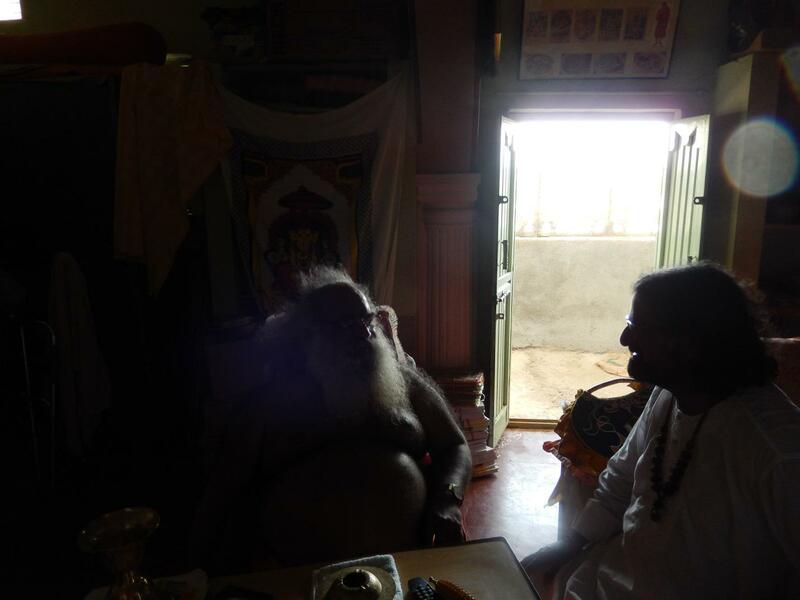 We spent about an hour there and were fortunate to get the blessings of the 88-year-old Siddhapurush, who can speak many Indian languages and had extensively toured the world. In the evening I along with Mohanji, Preeti, Murty and Jagdish took the Nanded Express from Banaglore station to Raichur. After an overnight comfortable train journey we headed towards destination Kuruvapuram. Mohanji in conversation with Sri Sri Sri Swamy Vitthal Babaji, We witnessed such a immense flow of love from Vittal Babaji. HE was so overjoyed having met Mohanji. 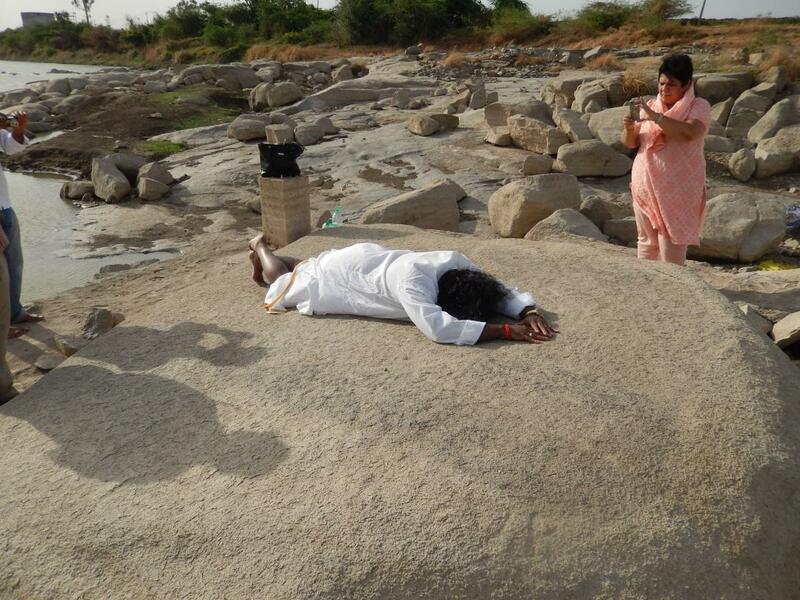 Mohanji Prostrating to SriPada Sri Vallabhab “on the rock” which was used by SriPada Sri Valabha to do SuryaNamaskar every morning. 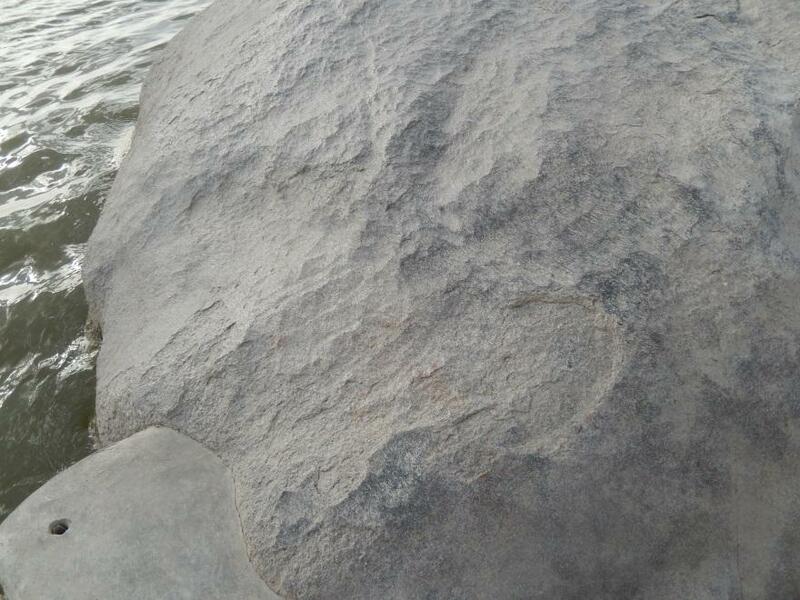 It is said that that such was the ‘Tej’ of Sri Pada, Sri Valabha that the color of the rock darkened. In this picture Preeti is also clicking another one. 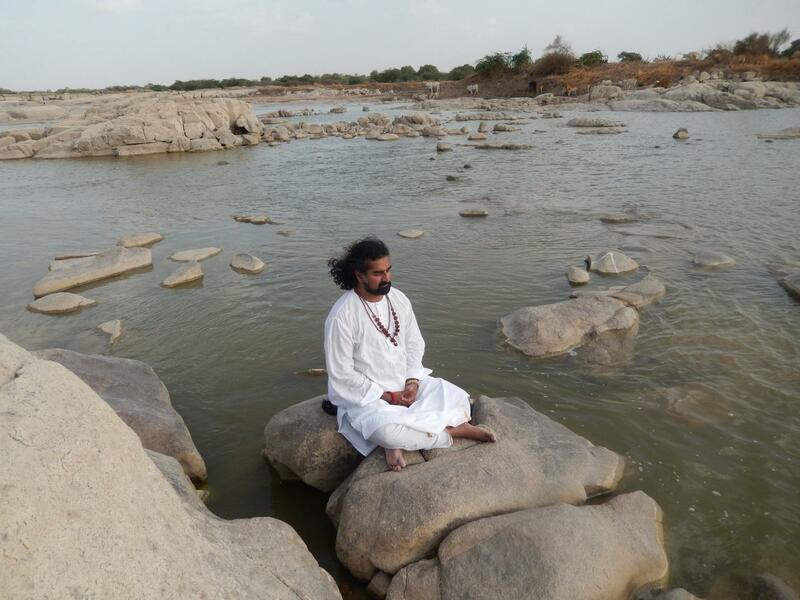 Mohanji in communion with the Almighty at the Krishna river. 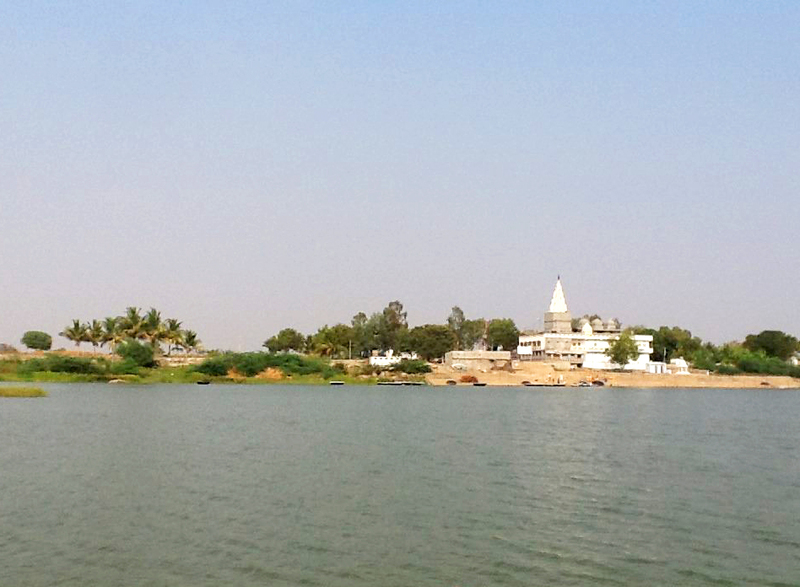 Ferrying on the boat to cross Krishna river to reach the temple on the other bank of the river. 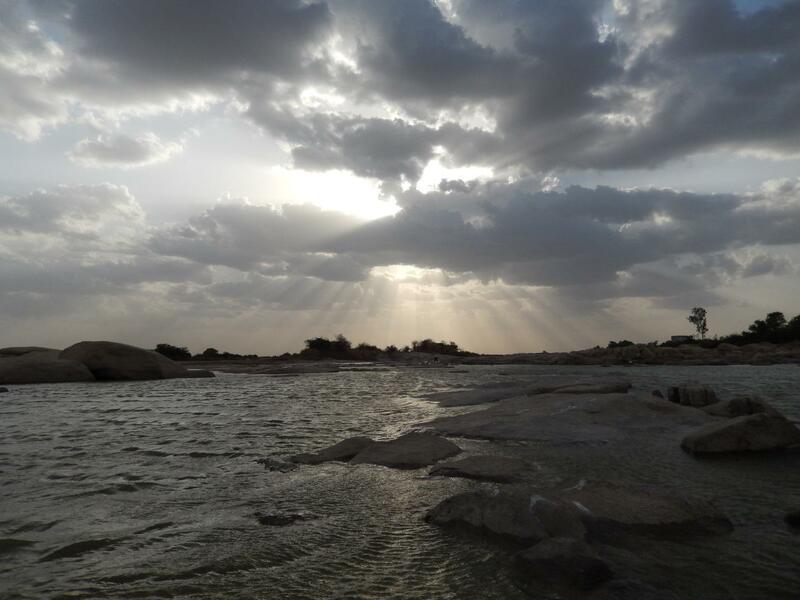 The sky also looked gorgeous, the travel thru the river on the round boat was so blessed by the clouds, which sheltered us from the scorch sun. Under the Bunyan tree, where Sripada SriValabha used to be in communion with the GODs in the nights. Mohanji in communion at the Ganesh Temple at the Vitthal Babaji Samadhi Complex. 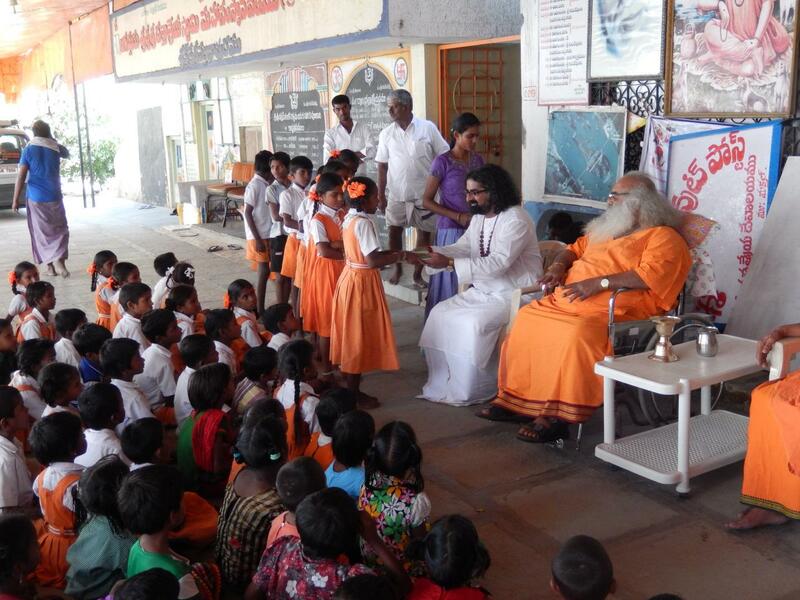 Mohanji giving away awards to the school children at the Vithal Babaji’s ashram. 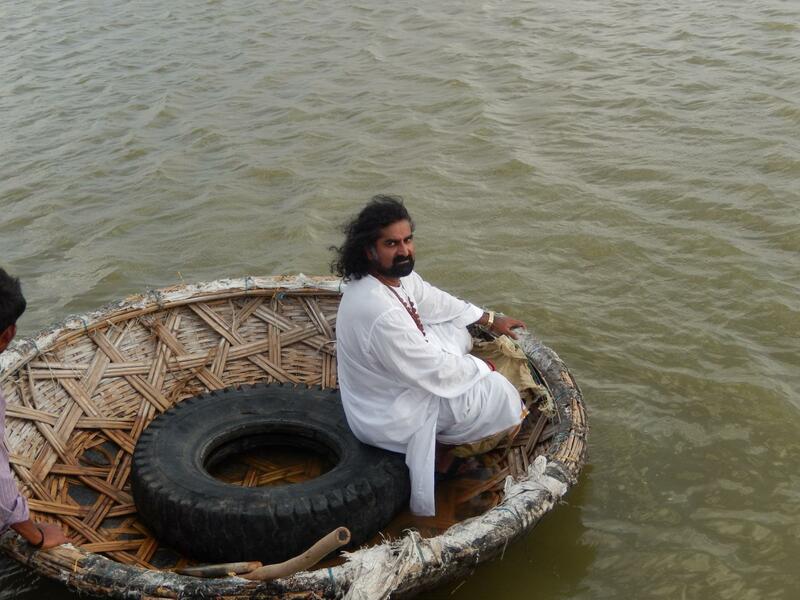 The stay at the ashram was absolutely stress-free. The arrangements were simple but full of love. The food was served by the ashramites with love and affection. 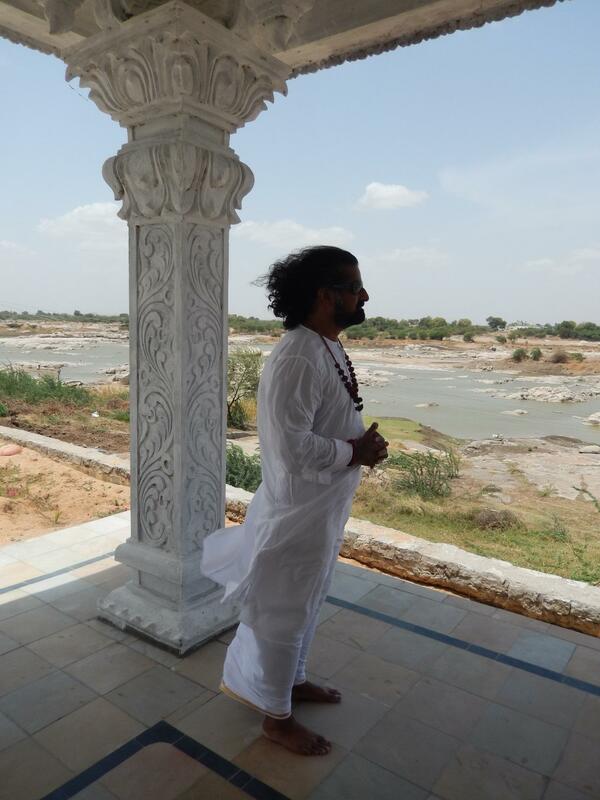 In a matter of 0ver 36 hrs at the ashram we got abundance of everything that soothed the soul. Soon the time to depart approached, but I did not feel that I was going to miss something, all I knew was that I was feeling light. 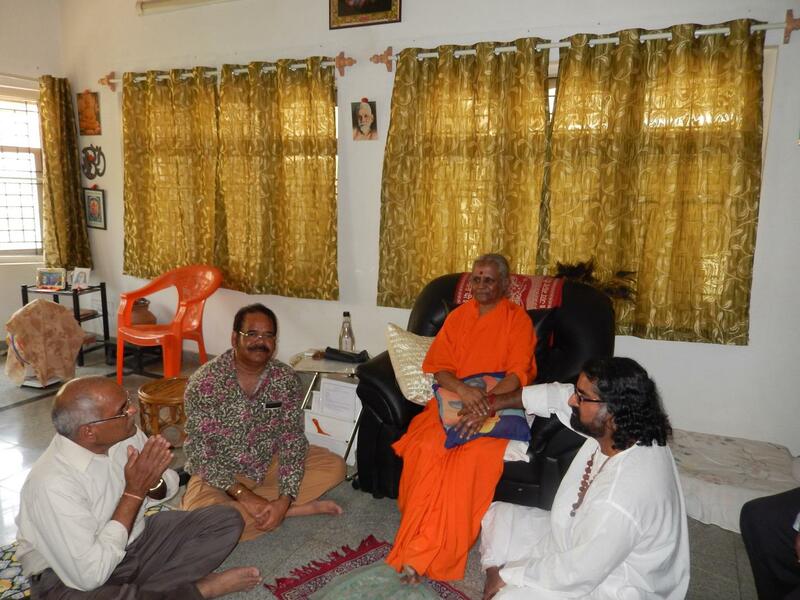 We took Vitthal Babaji’s aashirwad and departed for Raichur railway station at 8:30 PM on 25th June 2014. Took the train just after midnight and retired for the day on our berths. A big Thanks to Murty Garu and Preeti for organizing this trip. In the morning we were in Bangalore at the Duggals’ place. We were planning yet another visit to Devi Amma’s place. I was to move out of Bangalore in the evening. After taking the blessings I departed for the airport to travel to Mumbai. I arrived in Mumbai and further travelled to Nasik & reached home to meet my parents on the eve of 26th June 2014. My initial plans were to return to Muscat from Bangalore itself, however on request of my brother for some business related matter I detoured and reached Nasik. However the next day the business related meeting was held but did not yield the objectives. Once out of the meeting, my brother asked, “Shirdi Chalna hai”? This came as a total surprise. We went home, took my son Teshub along and headed for Shirdi. While all this was going on, Seema called from Muscat and conveyed that she wanted me to participate in the shani pooja at Nasik, which she organized with a Pundit. We had a good darshan of Shirdi Sai Baba and returned home at night. Next Morning on 28th June, I participated in the Shani Shanti Pooja, performed by a team of Brahmins and took the blessings and headed for Mumbai with Teshub. Having reached Muscat, I attended office on 29th June 2014 during the day. However by evening I was down with severe fever and intolerable body pain. This situation continued for three days, this was three days of severe cleansing. I am grateful to the Almighty for this cleansing and introducing me to many lovable personalities especially Preeti and Rajeev Duggal, who have been such wonderful people. Bless The World Family worldwide celebrated Guru Poornima on 11th-12th July this year. For the first time, there was a global live streaming satsang with Mohanji, attended by people in BTW centers from Australia, UAE, Great Britain, Macedonia, Serbia, South Africa, India, the USA, Canada. We are grateful to BTW team Mumbai for organising this and making a leap in the quality of utilising Mohanji’s time and energy. 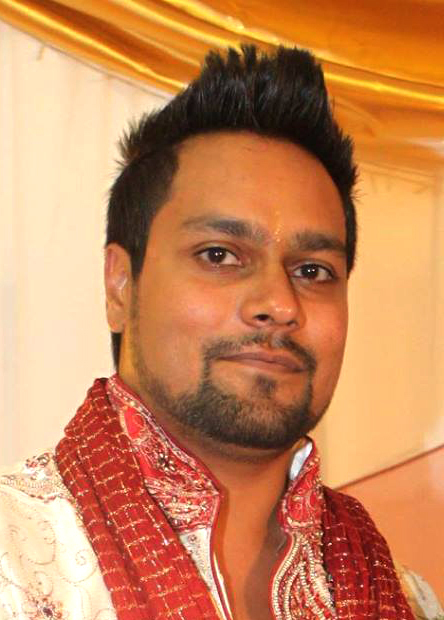 You can watch Mohanji’s message here, or read it here. How Bless The World Family expressed gratitude to the guru principle, you can see in the following summary of all activities initiated by Mohanji. 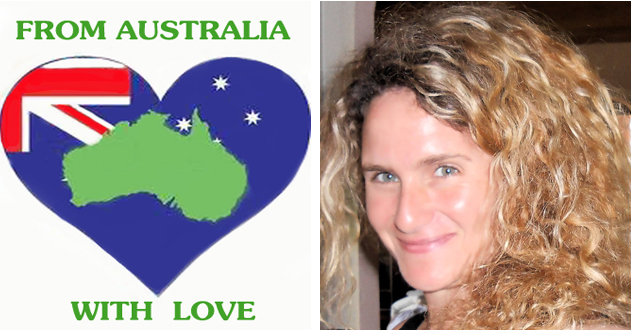 Feel the global bliss around our beloved master and the attitude of service which is the most immediate way of expressing unconditional love and tuning into our real nature. Living it leads us to the supreme consciousness. “Mohanji thank you. 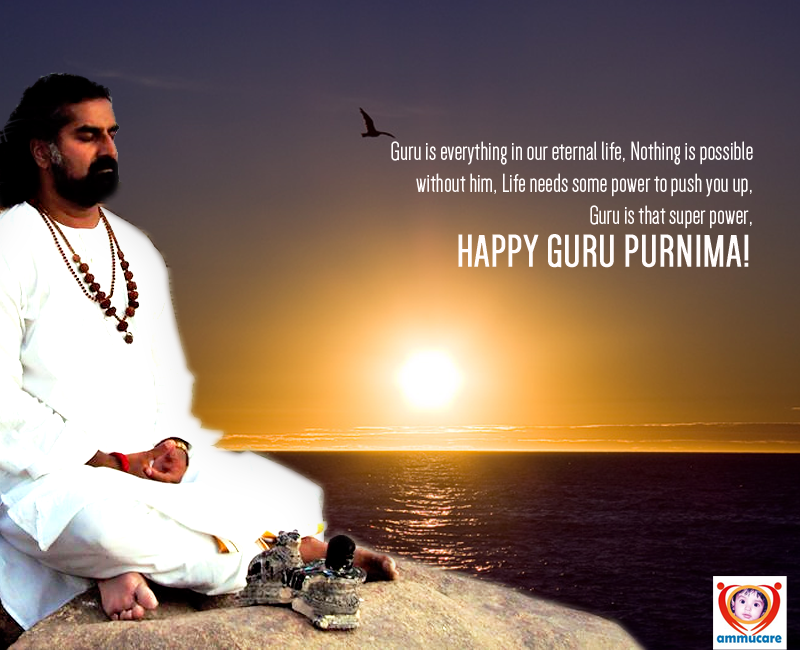 Thank you for being our living guru – our link between the mortal and the immortal. Thank you for showing us the path to the light. Thank you for changing the course of our life, for teaching us the value of personal responsibility, for teaching us devotion and discipline and for helping us to find these qualities in ourselves. Thank you for your tireless work and the wisdom you provide us with. The USA also had a programme where they performed Arti of Mohanji and food seva. The program for Guru Poornima at Muscat Oman started with Mohanji’s AArti, Gayatri chanting and bhajan. It was followed by Food Sewa to construction workers. What an awesome GuruPurnima!!! 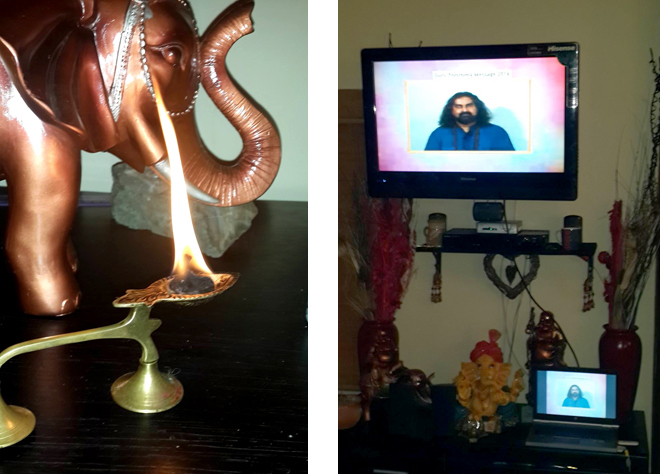 Listening to GuruDev speak and the Skype call……..we all had such a wonderful time. Thank you so much BTW Mumbai and esp Mishraji. Thank you for your grace and time Gurudev. On my behalf I would just love to say thank you Mohanji for helping me and being with me always. Thank you all for an amazing celebration at the ashram… we all love you with all our heart guruji, Mohanji. Next there was Mohanji’s feet pooja, where 108 flowers were offered as a group to the mould of Mohanji’s Feet with the chanting of Mohanji’s Padam Pooja mantras. 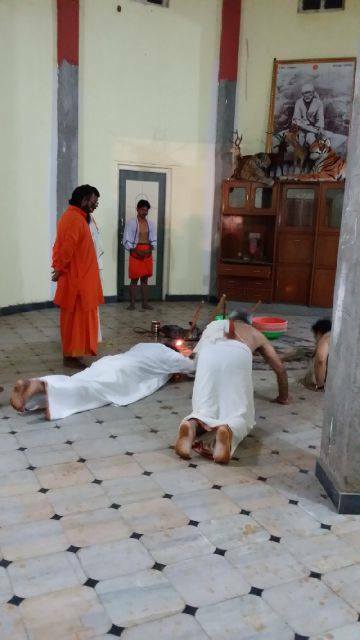 After Strotra chanting, there was also Abhishekam of Shri Vasuki, who protects Mohanji at Merudanda ashram. Full Mohanji pooja followed including khalsa stapana and homa. 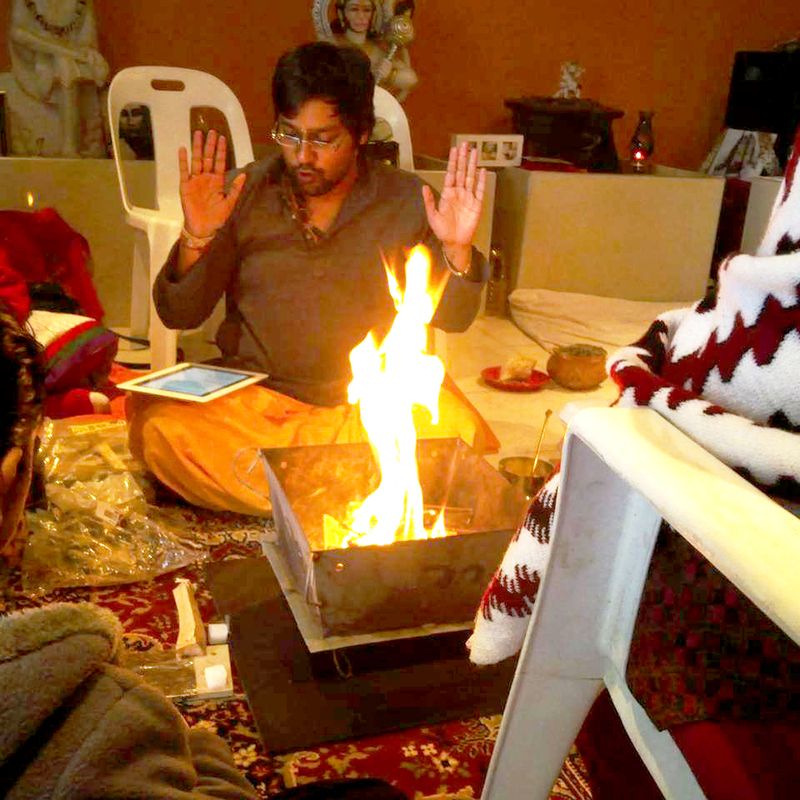 Homa was performed with offering to Shri Mahamritunjaya, the deity of healing and protection. Sankalpa is for healing and blessing Mohanji’s physical body. The afternoon programme also included Mohanji gayatri chanting and Abhishekam of Narmada Shivalinga. Can you see Durga and Luxmi in this photo? Truly blessed. Today our cancer outreach in Polokwane went to an informal settlement to render our screening and awareness program, So glad that we blessed to serve these communities, Thank You Transnet Foundation for your mobile clinic that reaches the most vulnerable communities that is otherwise out of the radar! Cancer can be beaten! Be cancer Wise! 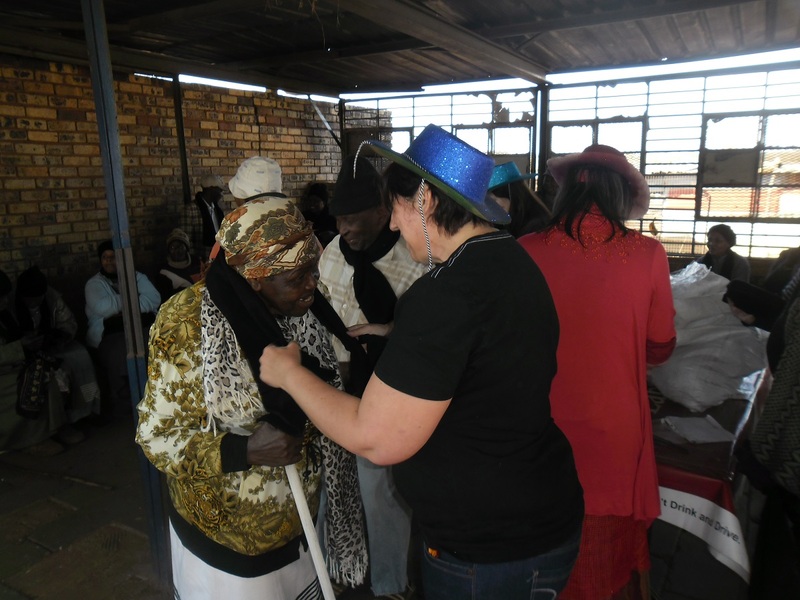 50 Underprivileged elderly folks were given warm woolen hats, with a scarf and gloves. We are deeply affected to once again see the poverty and suffering, and how blessed we are. We thank all the Gurus throughout the ages – this is our way of saying thank You. We had the privilege of handing out 55 sets of woolen caps, each with hat, scarf and gloves.We were once again made so aware of the profound depth of poverty that millions are steeped in. Today we decided to focus on the elderly folks. There were so many different dynamics at play. Some of the people were suspicious because the history, namely “Apartheid”, where the indigenous African people were totally suppressed and abused by our so-called ‘white’ ancestors. Then there were the ones who showed such joy, love and gratitude. The old Magogos (Grandmothers), and the old Madalas (Grandfathers) were so open to us, and we saw many a smile, some toothless grins also. It was a beautiful and infinitely sad all at once. Our dear Riana could not unfortunately attend, she is snowed under with work, but they will be doing seva at an animal shelter soon. We are so grateful that our Mohanji has inspired us to do seva with gusto and with deeply felt appreciation. 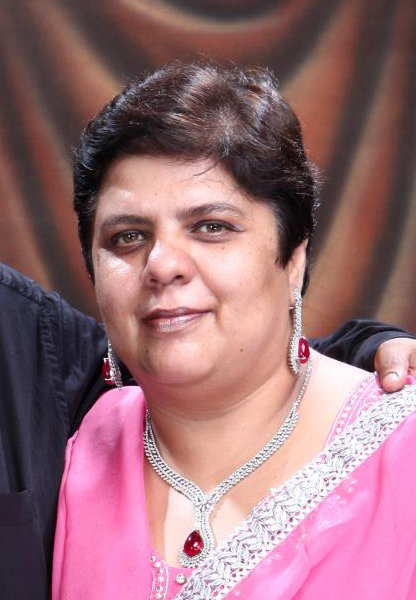 We would also like to introduce Marina Coetzee, who will be going to India to meet Mohanji. Another shining soul. Thanks to Abby, Sue and Irene for joining us also. We’ve realized that blankets are another huge need, and we’ll all do our utmost to see to blankets in this freezing weather, asap. They had Power of Purity meditation followed by Mohanji’s aarti and online Satsang on the occassion of Guru Poornima. We are grateful to have Mohanji in our lives. We attended the global satsang. For the special occasion of Guru Purnima, BTW Macedonia gathered to participate in the first online Satsang with Mohanji. We chanted the Mohanji Gayathri, and collected Guru Dakshina. 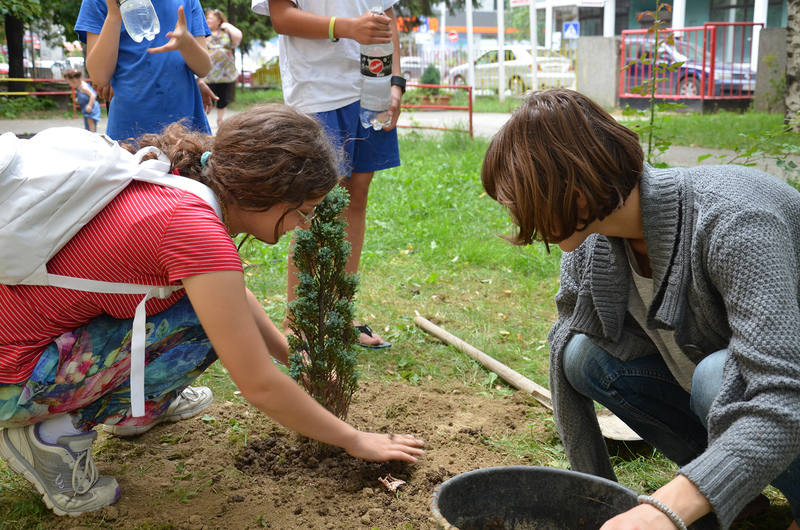 To mark this day and show our love for our Beloved Master Mohanji we planted trees in the yard of the Home for Orphans “11 October” in Skopje, Macedonia. When we showed up with the proposal in front of the director of the institution, she was happy to accept our kind donation and did everything to help us realize it. Many kids showed up in the yard and wanted to help with the digging, planting, and watering of the plants. They were so joyful. In the end we bought some chocolates for the kids and we bid farewell. All throughout the tree plantation activity, from collecting the money, to buying the trees, and planting them, our hearts were melting from joy and gratitude for having an opportunity to celebrate our Mohanji’s special day. We were all feeling His heart-warming presence throughout the whole day. Sabrina Koletic paid for the healing of a cat who has been in an infirmary for two months and Kristina Jelavic bought food for abandoned animals. Sanja made a beautiful video Mohanji – Manasa Bhajare Gurucharanam, a collection of various quotes on Guru principle and Guru – disciple relationship given by different saints and Gurus. Some of them are Sri Mohanji, Sri Yukteswar Giri, Paramahansa Yogananda, Neem Karoli Baba, Sri Nisargadatta Maharaj, Shirdi Sai Baba, Swami Vivekananda, Swami Rama. 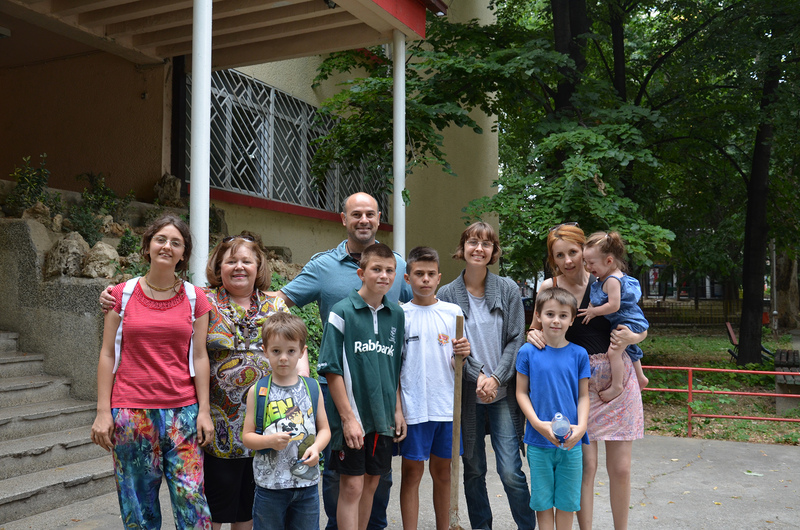 It is beautiful how people from the countries of former Yugoslavia (Serbia, Macedonia, Croatia) connect well to Mohanji. The more divided their country was, the more they craved for unity and oneness. 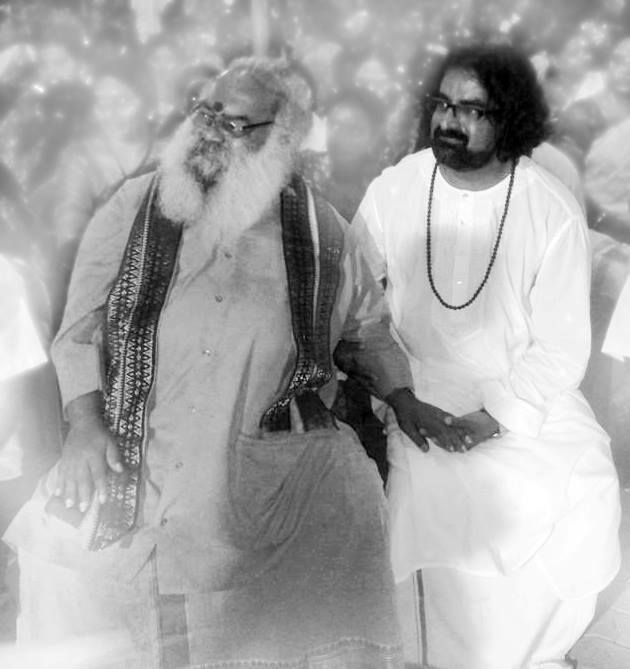 We thank our dearest Mohanji, our friend, philosopher, guide & guru for the beautiful message of Guru Poornima. We Thank our friend Sandeep & his team for bringing the Whole BTW Family to rejoice with Father on this auspicious occasion of Guru Poornima. Thank You all our lovely BTW Family without your love & support it wouldn’t be possible. We love you Mohanji.. our Bhagwaan.. Guide.. Father.. Mother.. Brother.. Sister.. Friend.. our everything. On 12th July, the auspicious day of Guru Poornima, beloved Master Shri Mohanji did Pran Pratistha of Shirdi Sai Baba Idol in South Mumbai. 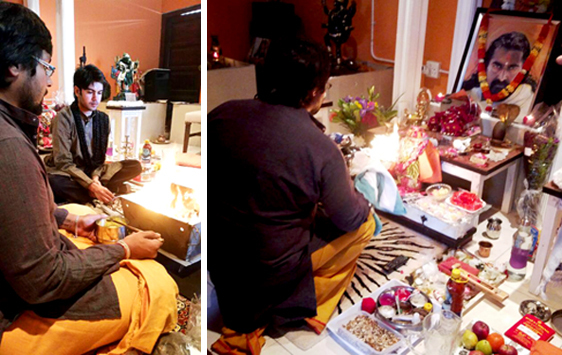 After that he performed Havan. This Temple in South Mumbai is coming as a replica of Shirdi Sai Baba Temple. Shri Saibaba’s grand temple has been built in South Mumbai with the blessings of Sai Baba to fulfill the desire of Sai baba devotees. Inspired and designed from the original Shirdi Temple’s Shri Sai BABA’s 5.3 feet idol ,this divine idol installed by Parampujya Rajayogi Sadguru Shri Mohanji Maharaj. Accompanied by Respected Ved Visharad Shri Yashwant Bhaskar Paithan, great bhakt well versed in Vedas. Gratitude to Shri Dinesh Shah and family, the benevolent donor of the idols of Shri Sai Baba, Shri Ganesha and Shivalinga. 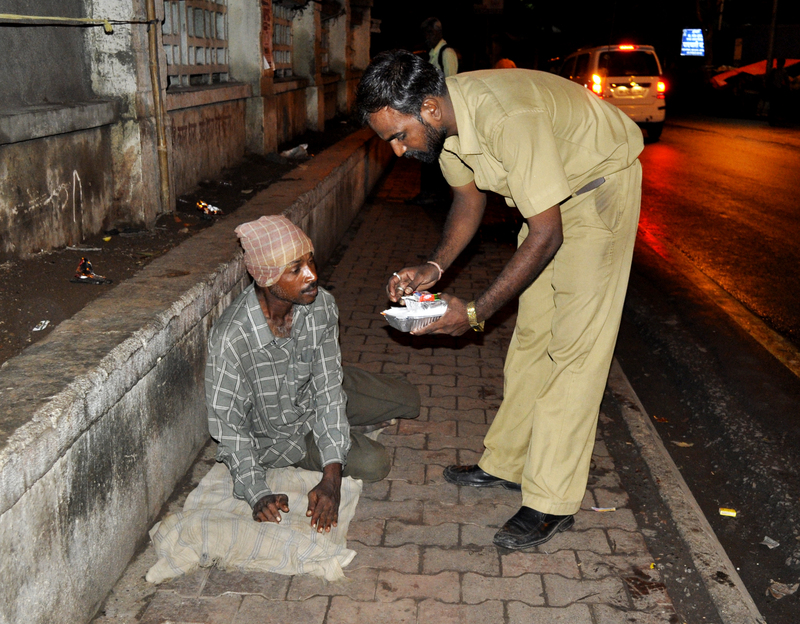 On the blessed occasion of Guru Poornima BTW Pune decided to give food to the poor, hungry people after washing their feet and hands. This was Guru Bhiksha. Chanting Mohanji’s Gayathri during the seva. 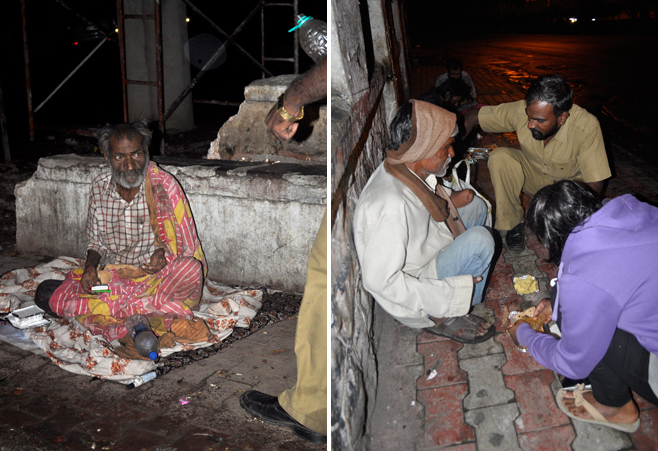 We intended that we offer food to our Master by feeding the homeless and do pooja of Mohanji’s feet by washing the feet of the uncared for. Shubhangi narrates that even though she cancelled her participation because she had to go somewhere else urgently yet she still wanted to join others for the seva. She needed that extra push and right at the last minute when they were about to leave for the food seva got a call by the team, she could come back in time and jumped at the opportunity. She felt so good after the seva and thanked Mohanji for never leaving her. She says he fulfills all her desires always. 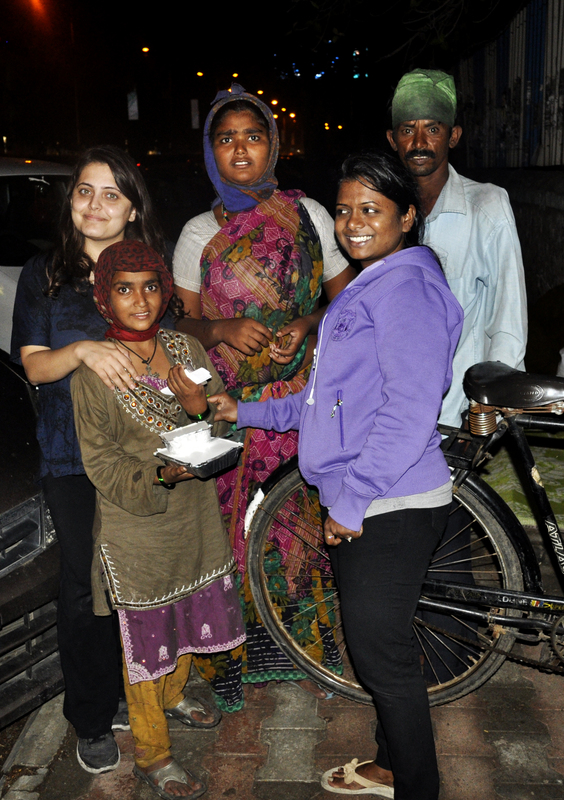 Palak writes,” India as a country has no dearth of poverty. 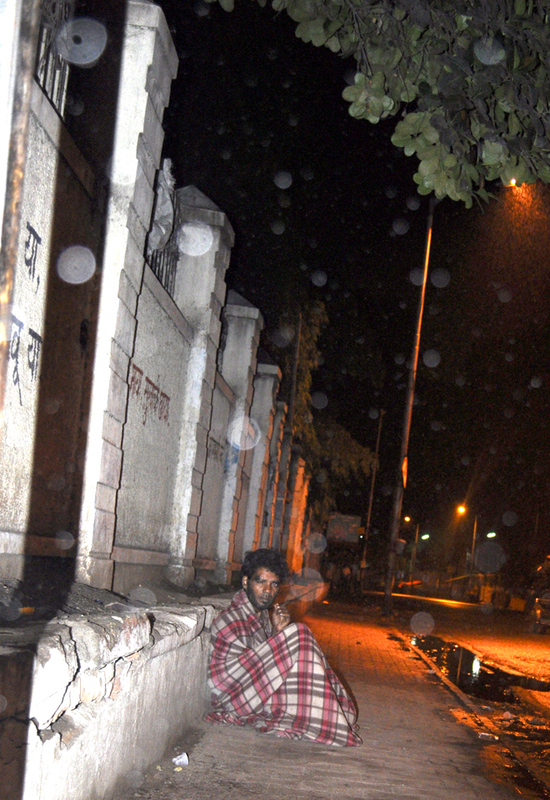 Beggars, homeless destitute and addicts are ample in number. 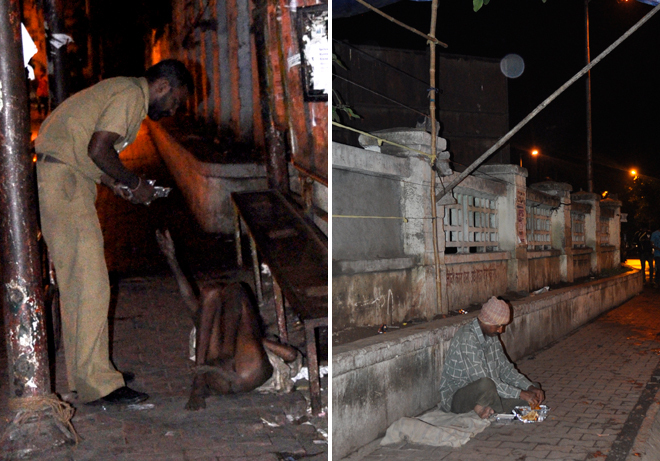 In a busy marketplace with profuse number of restaurants would also be a number of homeless at different junctions. It’s a convenient thought to assume that they don’t work, they beg while we work day and night. This makes us so insensitive and non compassionate towards this bitter reality that we acknowledge them as the street people. As if that’s where they belong and we cannot do or should not do anything to change that. Most of us walk past them without a single decent glance at their condition. I saw some of their eyes again today. I don’t know their past, or why some of them were lying semi naked in dirty corners of the street, so lonely, unloved and uncared for, some probably hadn’t washed their hands with soap for months.. some were handicapped, some smelt of human excreta, some of alcohol, some of pain and loss and some looked like zombies.. but their eyes couldn’t lie.. their eyes had soul in them. It was the same soul as yours and mine. There was no difference between me and them. And we all know who’s consciousness was working through this experience. (Mohanji’s of course!) I clearly recall that radiance in the eyes of a young man who walked up to us.. his hands were black with dirt…. 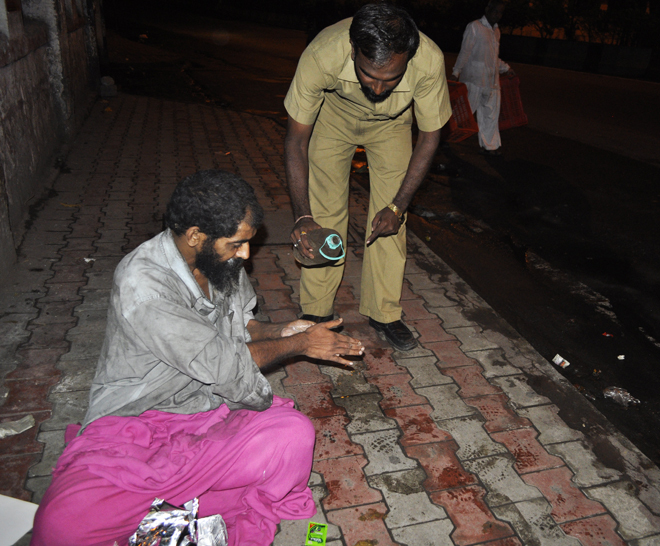 before giving him food we gave him soap and shampoo and helped him wash his hands with soap. Oh boy was he happy! Today’s seva truly transformed me. 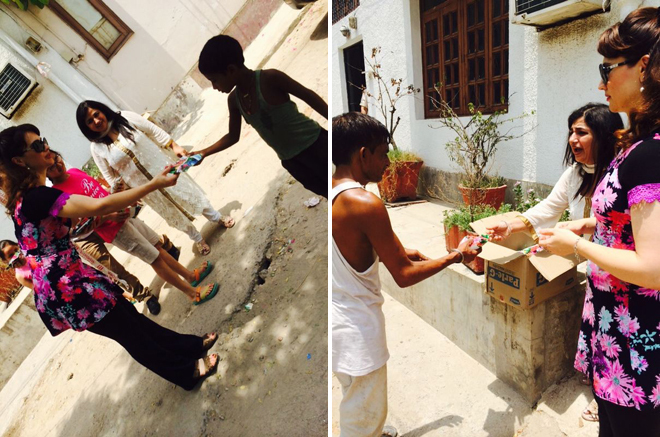 We could spend time with each person we did seva for. We washed their hands, spoke to them, opened hot food and served them each dish, sat with them, fed some, hugged some, they felt human.. they felt loved.. we felt loved.. love is the only universal language. Love needs to be expressed more tangibly. I cannot imagine a life without serving these people in some way or the other. Life would have been shallow, a meaningless self centered drama of emotions had it not been for my saviour, my Guru, who not only taught me to serve by His example, by walking the walk, but also always gives the grace to aid the service. Always makes it happen, provides the needy, provides the material to serve the needy, provides the people who would assist in the seva (Service), provides the thought to serve, aiding our liberation and spreading love on the planet. My whole life can go by singing praises of my Guru and it won’t be enough. 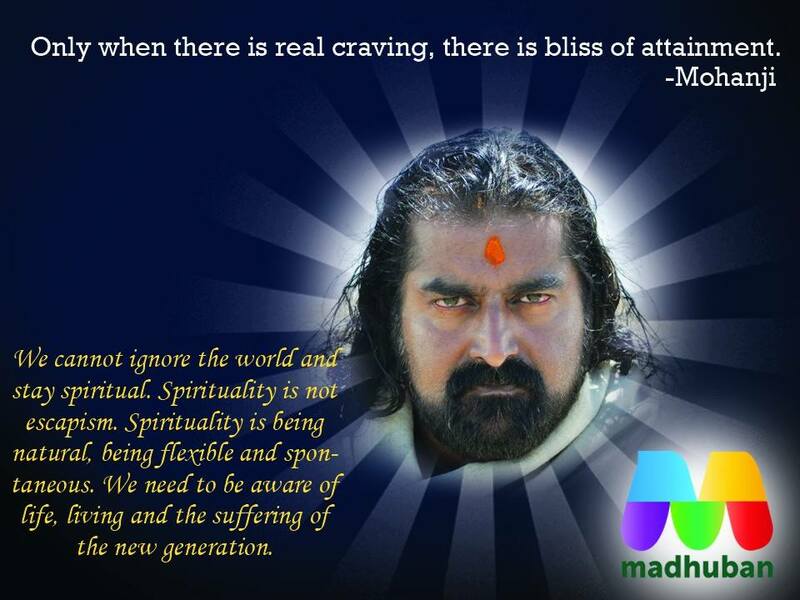 Nothing .. no expression can express even a fraction of the grace, compassion, love of a Master such as Mohanji. HE is the journey and HE is the destination. 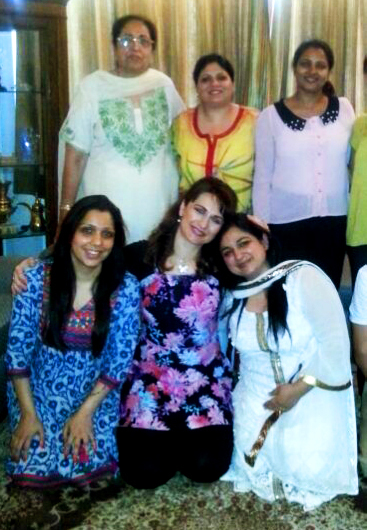 We had a divine Satsang and Meditation with Our beloved Biba ji today. 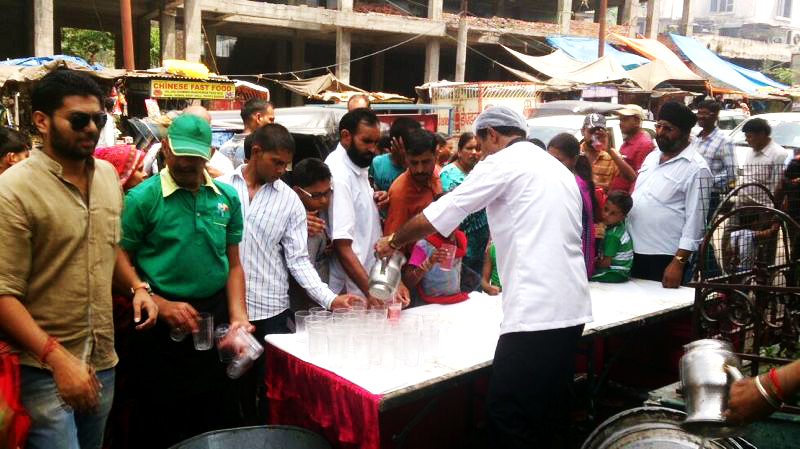 At Patel Nagar… Followed by Food sewa in west and central Delhi distributes more then 300 food packets. 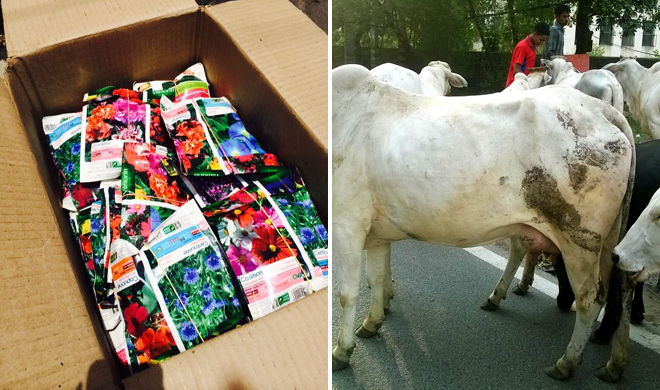 In Gurgaon we had Cow Food Sewa as well after 5 pm. Love to all of you. 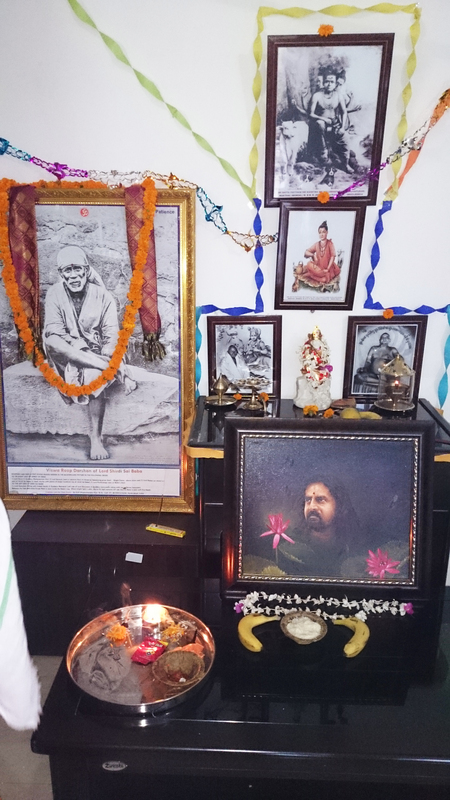 On the day of Guru Poornima, we dedicate this space to the thoughts of a person whose love and graciousness has touched a lot of souls, leaving each inspired, motivated and at peace with oneself. 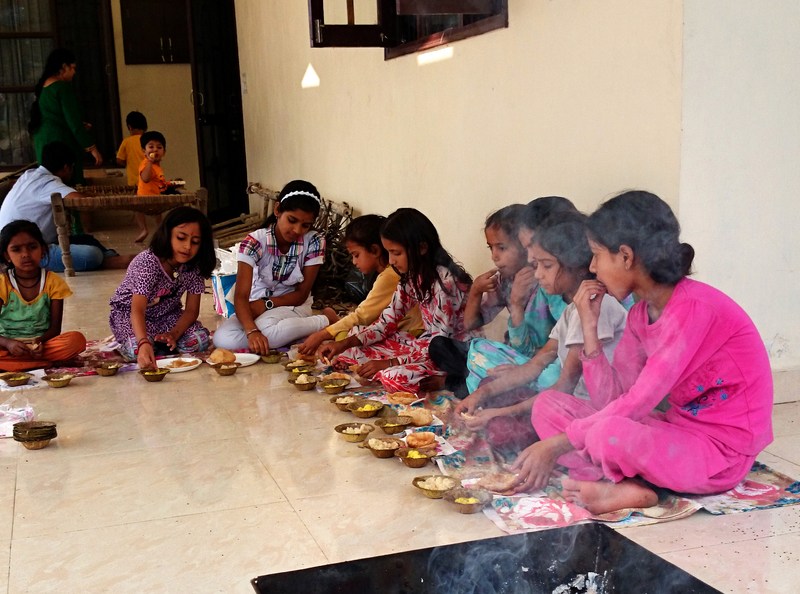 Today on the auspicious day of Guru Poornima there was pooja, Bahajan, satsang and Food seva for the children at Mohan ji’s Ashram Kud in Jammu. The day was celebrated with great enthusiasm and seva bhaav. Here are some of the images of the occasions. 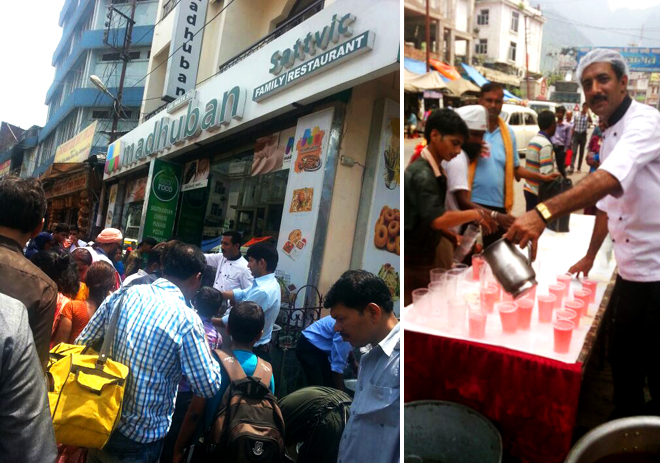 There was food seva in Dharamshala.